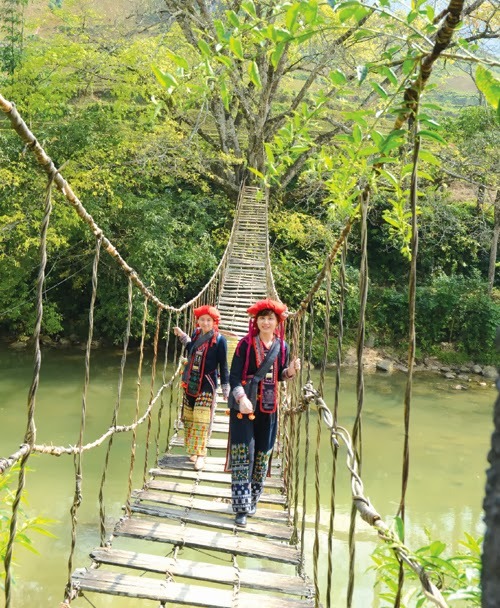 It would be a miss if you travel to Sapa without visiting Silver Waterfall and Rattan bridge. Especially, Rattan bridge is a well-known bridge made from rattan which acrosses Muong Hoa River. If you visit the bridge in foggy days, you will feel like you are covered by cloud. Cau May is 17km from the south-east of the centre of Sa Pa Town. In order to reach Cau May, you can go along for 3km from the main road. It is very interesting to enjoy a cloud air at Cau May. This is really an interesting place to enjoy the most wonderful feelings. All year round, the white water flow pours down to the stream. It looks like a picture with two main colors: green from the forest and white from the waterfall.